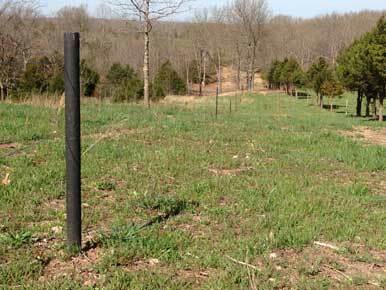 PasturePro boss posts are rigid in-ground posts for use between corner posts along bends, ridges, and dips in a fence-line. Boss posts are self-insulating and made of post-industrial recycled polypropylene and reclaimed wood sawdust. PasturePro boss posts can be driven under most soil conditions. Call 1-800-563-6771 for more information. Boss Post Sizes and Prices. All boss posts are 2.5" in diameter. Call 1-800-563-6771 for shipping and ordering details. What are the boss posts made of? PasturePro boss posts are made of post-industrial recycled polypropylene and finely ground wood filler, along with a small percentage of process additives such as pigments and UV inhibitors. Our products do not contain any PVC or fiberglass and we take great care in avoiding the use of hazardous materials during our manufacturing process. I'm ready to try some, where do I get them? You can order directly by giving us a call at 1-800-563-6771. Where are the posts manufactured? PasturePro boss posts are made at our plant in Nevada, Missouri. Nevada is located about 90 miles south of Kansas City and has experienced first-hand the impact of manufacturers moving their facilities overseas. We are proud to resist this trend by offering a high-quality, cost-competitive product that is made in the USA. PasturePro boss posts can be driven just like wooden posts under most conditions. Give us a call at 1-800-563-6771 for specific installation instructions. Give us a call at 1-800-563-6771 M-F 9am-5pm CT or submit your question to our contact form.